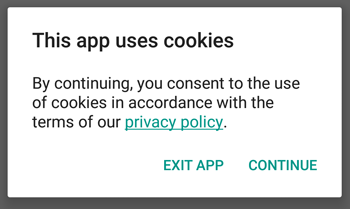 On the onCreate method of your MainActivity, create a new CookiesConsetDialog or CookiesConsetOverlay and call the method showIfApplies(). There are just a few strings to be translated, so if your language is not supported, please help us by sending the translation. You can send a pull request or just send me the strings, as you like. I will try to keep the library updated with the translations that I receive. The code to detect if the user is from the European Union is from this Stack Overflow question, asked by Mr.Betatester and answered by Ruyo.